I’m weirdly excellent at naming songs just after a few seconds of it being played. It’s one of my many useless talents. Though, if I were playing Song Pop, my tune-naming talent would be of very good use. So who is the guy behind our boy Mark’s addiction? Let’s travel back to ’95 when Alanis Morissette was still popular and I was still in elementary school. 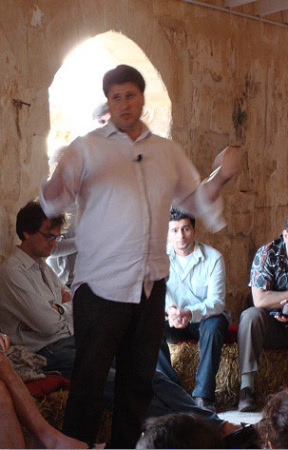 Mathieu Nouzareth started his entrepreneur career in 1995. He was just 23 living in France at the time, and co-founded WebConcept, an e-business consulting company, that was later sold to IconMediaLab where he was the CEO till 2001. With his brother Roman on board, Mathieu started a digital game distribution business called Boonty.com in 2001. It grew to become one of the largest companies of its kind, with 180 employees in over 30 countries. The bros also started Cool Entertainment in 2006 that is now the biggest Facebook game company in Europe. The brothers have now set up shop in New York with their new game company, FreshPlanet, where our little Song Pop was born. The music game app is wildly popular with 25 million unique players with over 4 million active users daily. This insane growth puts it at the second fastest growing app right now, behind Washington Post Social Reader. We’ll see if Mathieu and team can keep up the good work in the coming months. For now, anybody up for a little Song Pop challenge with the tune master…(ahem, this guy)?